The Secret of Life? Tacos. By understanding a people’s food you can understand their culture and what they believe in. When I saw Denise Chávez at the Tucson Book Festival last weekend, I told her that the reason I liked A Taco Testimony so much was that it was full of surprises. I’m sure there are people who approach the book with expectations that are not met–it is not a Mexican cook book (although there are some recipes), and it is not a homey “mama’s comida” book. Chávez goes to great lengths to disabuse the reader of the wrong expectations, right from the start. This is not a sweet little book about tacos; it remembers the fights that began at the kitchen table, spilled into the dining room, then moved quickly into the living room and continued into the bedroom with the sudden slam of a door that led to the hushed sound of someone crying behind the door. A “sweet little book” it is not. But because Chávez writes poetry and writes for the theater, she presents us with family drama and even the narrative frequently reads like poetry. The structure reflects a poet’s love of circular paths and repetition. And while some of the family drama may be painful to read about, there is nothing gratuitous about the pain. Every word and every scene brings us closer to understanding the culture of the Mexican/Mexian-American/Chicana/Chicano people who live in west Texas and southern New Mexico. …you venerated your Mother Culture more, while to be a Mexicano in southern New Mexico, my Father’s family, at least, that he and his clan moved away from their native roots. So A Taco Testimony, does have recipes, and it is a memoir of a specific family living in southern New Mexico, but the author’s probing mind wanders far beyond Las Cruces and the nearby El Paso. I would recommend this book to any travelers who wants to ponder the importance of culture and appreciation of differences, but particularly to a traveler with a road trip through New Mexico in mind. Northern New Mexico has the American Indian culture, the stylish shops of Santa Fe, the mountains and beautiful scenery. Southern New Mexico demands a more attentive traveler to find its appeal. A flat land dotted with dusty struggling towns, you may be tempted to rush through and write it off. I hope that Chávez might change your mind. By the way, if you plan to be in southern New Mexico in April, check out the charming town of Mesilla, where Chávez heads a book festival. Take a look at this fascinating book festival in a small New Mexican town. I would love to read this, especially before taking another road trip to New Mexico. I wouldn’t be a fan of the hefty tacos that Chavez like. Make mine thin and soft like the ones in Tucson. Just added this to my shopping cart. It sounds right up my alley. I grew up in Northern California where there were a lot of migrant workers from Mexico, and consider tacos to be a staple in our household, even if they’re not traditional tacos all the time. Might just be the BEST book title ever. Truly. Love it. It sounds to me like the story would make an excellent stage production or dramatic reading somewhere. Sounds like a really interesting read Vera! Thanks for writing about it on your blog. This book sounds fascinating. Thanks for the review. You really read such wonderful books, Vera, and I’m glad you share them with us! This looks like an incredible book to me. Thank you so much for this short, but intriguing review of it; it’s now on my to-buy list. I think I’m going to get this book, not because I’m a fan of tacos — which I am — but I love books that provide a philosophical take on culture. I’ve bicycled and hiked all through the Southwest so I’m looking forward to reading this. This sounds like a wonderful book! We love SW food and the culture there in general, so I think I will add this to my collection. I do love tacos- but more so- I love to read about the cultures- and I loved your short comparison of the differences in your neck of the woods and other places. It reminds me of the Chinese in Singapore and the Chinese in Hong Kong – both Chinese descent- but definitely different cultures because of the area they are in- the evolving- even the Chinese in Singapore as opposed to Chinese in Malaysia. So I can very well imagine there will be such differences with a cultural group in one State as opposed to another State– it has fascinated me how each State is sooooo different!!! Then you put all the various ethnic cultures in with that- and you get some interesting evolutions. oh. this is my very favorite article on your site. i’m GETTING this book., and i love how deeply cultural it is. thank you! This sounds like my kind of book. 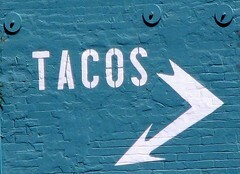 I’m fascinated by tacos too–it’s true they can be so different from the fillings to the tortilla. I haven’t tried the thin wheat variety. I’m going to be looking up Chavez’s book at the library today. Thanks for this! And, Kristen (MyKidsEatSquid), in your article on Greek yogurt guacamole you show “taquitos”, which are what Chavez refers to as tacos!! I don’t think I’ve ever seen the very large thin wheat tortillas outside of Tucson and Sonora. Wheat tortillas, yes–but not the gigantic ones.